Alice Through the Looking-Glass Usborne The quirky sequel to Lewis Carroll's Alice's Adventures in Wonderland retold for children growing in reading confidence and ability. After returning from Wonderland, Alice's adventures continue when she steps through a looking glass and into the topsy-turvy world beyond. Part of the Usborne Reading Programme developed with reading experts at the University of Roehampton. Retold by Lesley Sims. 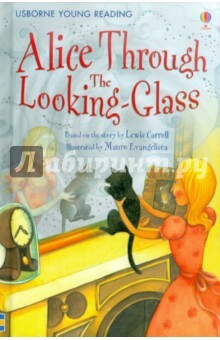 Аннотация к книге "Alice Through the Looking-Glass"
The quirky sequel to Lewis Carroll's Alice's Adventures in Wonderland retold for children growing in reading confidence and ability. After returning from Wonderland, Alice's adventures continue when she steps through a looking glass and into the topsy-turvy world beyond. –20 % Выгода 133 ₽ The Adventures of Huckleberry Finn 1 рец. Если вы обнаружили ошибку в описании книги "Alice Through the Looking-Glass" (автор Lewis Carroll), пишите об этом в сообщении об ошибке. Спасибо!